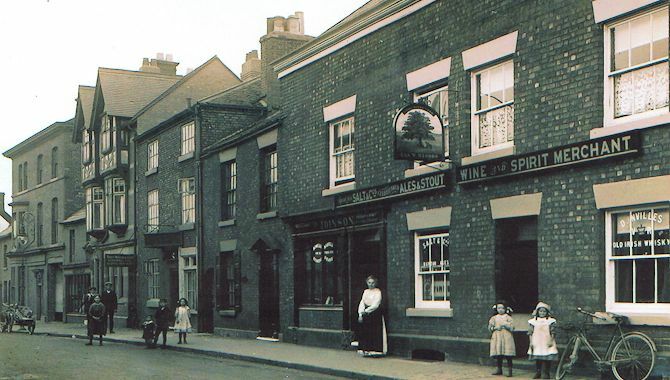 COMMERCIAL premises in Beam Street, Nantwich, had quite a different use in their history. The three-storey building to the left of centre in the picture is now the home of Johnson's Printers, but used to be a cocoa house. In recent times it was an entrance for customers but is now one of the printer's offices. The entrance is now round the corner in Oat Market, behind another of the firm's properties and next to The Talbot public house. Number 8 Beam Street is a building with an interesting history as it was previously an alehouse - an outlet for quite a different beverage. It was known as The Talbot even though there was (and still is) a public house of the same name within a few yards. It was also called The Dog in the 1850s and shortly afterwards, The Peacock. It survived as an alehouse until 1883, then opened as a cocoa house for some 20 years. It issued tokens to help persuade people away from the demon drink - quite difficult with so many public houses close by. The Royal Oak was next door but one. The photograph shows buildings in Beam Street around 1910, On the left is the three-storey Acton’s stables (now the Malbank Hotel), and then a two-storey shop building. Next is a three-storey building with black and white detail which was the shop of John France, picture framer (now an opticians). The next building, also three-storey, was the cocoa house with nine rooms. There is a sign outside which reads Thos. Wood, currier and leather merchant. In the adjacent two-storey building (now the Superdrug store) lived Harry Bourne, baths manager. nearby three-storey building and is much wider. As recorded in "Lost Houses in Nantwich" (by Andrew Lamberton and Robin Gray; Landmark Collector's Library), Beam Street is in one of the oldest parts of the town, already standing in 1583 when the Fire of Nantwich struck. the building stood until 1983 when it was demolished. Formerly known as The Star Inn, it had one room that was known as the soldier's parlour where, for the Napoleonic Wars, they received the "King's Shilling". That is, they were recruited into the army. The inn was also the venue for meetings of the Giant Onion Society.